The Multi-Application Small Light Water Reactor (MASLWR) is a nuclear power plant test facility that is instrumental in the development of next generation commercial nuclear reactors currently seeking NRC certification. The test facility is constructed of all stainless steel components and is capable of operation at full system pressure (1500 psi) and full system temperature (600F). All components are 1/3 scale height and 1/254.7 volume scale. 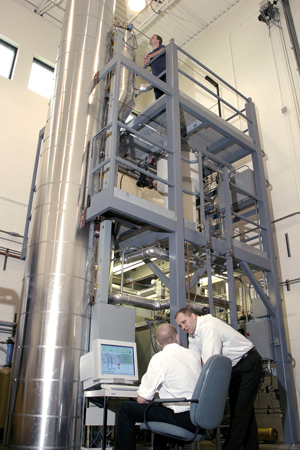 The current testing program is examining methods for natural circulation startup, helical steam generator heat transfer performance, a wide range of design basis, and accident conditions. In addition, the MASLWR Test Facility is currently the focus of an international collaborative standard problem exploring the operation and safety of advanced natural circulations reactor concepts. Over 7 international organizations are involved in this standard problem at OSU.